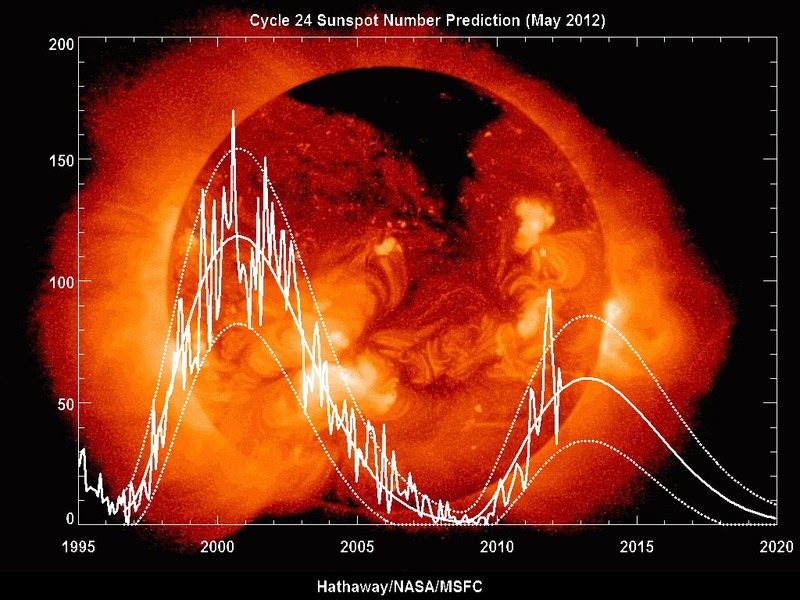 NASA/Hathaway's updated solar cycle prediction – smallest in 100 years | Watts Up With That? The smoothed aa index reached its minimum (a record low) of 8.4 in September of 2009. 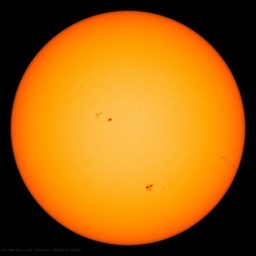 Using Ohl’s method now indicates a maximum sunspot number of 70 ± 18 for cycle 24. We then use the shape of the sunspot cycle as described by Hathaway, Wilson, and Reichmann [Solar Physics 151, 177 (1994)] and determine a starting time for the cycle by fitting the latitude drift data to produce a prediction of the monthly sunspot numbers through the next cycle. We find a maximum of about 60 in the Spring of 2013. The predicted numbers are available in a text file, as a GIF image, and as a pdf-file. As the cycle progresses, the prediction process switches over to giving more weight to the fitting of the monthly values to the cycle shape function. At this phase of cycle 24 we now give 66% weight to the amplitude from curve-fitting technique of Hathaway, Wilson, and Reichmann Solar Physics 151, 177 (1994). That technique currently gives similar values to those of Ohl’s method. But you can see where this is going. Falling or stable global temperatures are caused by the Sun and rising temperatures are down to carbon dioxide alone. Would this be sufficient then to trigger a new LIA? If so, how low can it go, and how long will it take to kick in? I see Piers is already predicting the coldest May in 100 years for the UK !!! I remember seeing a “prediction” from a while back saying that the next cycle (i.e. : this one) would be the biggest ever. Not to worry though: climate (global temperature) has nothing to do with the Sun, Some people say it’s all to do with man made CO2. Has anyone else heard of this or was I hallucinating? Interesting that Dr Hathaway has a predicted solar cycle length for SC24 around 13 years from look of his graph. Suggests the following cycle will also be cool, about 1-1.5 C below average. So, temperatures look like staying down until the mid 2030’s at least. Is it time we stopped trying to predict a non-linear, chaotic system. It might cut down on foolish attempts to control same ? ”Climate(global temperature) has nothing to do with the Sun” God please tell me you’re kiding. First time I think he’s error-ing on the low side… ever!! For months I’ve been quoting the statistic that up to a quarter of Scotland’s population died in the 1690s during the last Maunder Minimum. I’ve sent letters to MPs, MSPs, the Prime Minister, First Minister. For Scotland, this famine is a bit like the Boston Tea Party .. but in reverse! Instead of giving us independent, this was one of the events that lost us ours. With a new Minimum on the cards, with the an independence vote being on the cards. I thought this book would be in demand. But no! I’ve had it four months without a squeek. Then yesterday my library book “Famines in Scotland: the ill years’ of the 1690s” was recalled. I’ll put another plug in for having a post on the entire series of predictions for cycle 24. It would also be fun to watch the pro big cycle/pro small cycle ratio over the same time period. I beat Hathaway’s new solar cycle 24 prediction by three years. I predicted solar cycle 24 to be the smallest in the past 100 years back in February 2008. Success has many fathers. Failure is an orphan. I remember just a couple years ago, they were predicting that the next cycle would be the highest on record. And as we slowly grew into the new solar cycle, their projection kept gettting smaller and smaller (and being pushed back years at a time). Now to be the smallest on record. That explains everything, at last! Or at least, it would appear to explain everything about the disparity between the Spaceweather daily sunspot numbers and their subsequent monthly plots, which has been bothering me for quite some time. If the monthly plots are smoothed International Sunspot Numbers, as for the predicted numbers, then the factor is ‘Daily Number’ x 0.65 = ‘Monthly Plotted Value’. Though I still don’t know if they are plotting the ISN number for the last day of the month, or an average value for the month. If the monthly plots are smoothed International Sunspot Numbers, as for the predicted numbers, then the factor is ‘Daily Number’ x 0.65 = ‘Monthly Plotted Value’. Though I still don’t know if they are plotting the ISN number for the last day of the month, or an average value for the month. It is much simpler than that. The International Sunspot Number for historical reasons [to be compatible with Rudolf Wolf’s count for 1849 to 1865] is reported as 0.6 x the actual count, while the NOAA count is just the raw count [actually = 10 x number of groups + number of spots]. Leif Svalgaard – “Piers predicted last week would be with heavy tornadic activity in the US. Instead we got a snowstorm.“. Piers Corbyn is very strong on self-promotion, but even he claims only 85% accuracy on extreme weather events (http://www.weatheraction.com/pages/pv.asp?p=wact45). Thus about 1 in 7 of his predictions can be expected to be wrong. That you managed to find one of the wrong ones isn’t exactly a big deal. So is “usually” and “typically” different terms in science? And why would different values be observed at different observatories, when the “same basic formula” – and the same data – is used? Recent work [see Hathaway Solar Physics; 273, 221 (2011)] indicates that the equatorward drift of the sunspot latitudes as seen in the Butterfly Diagram follows a standard path for all cycles provided the dates are taken relative to a starting time determined by fitting the full cycle. If and when the Southern Sunspot Belt manages to gravitate towards the Solar Equator, I suppose there will be something to base the calculations upon. Until then, it’s SC24 and it’s ill-behaved monkey business as usual. Will this result in a reduction of ocean heat content? If so, how long will it take for it to noticeably decline – and then how long for surface temps to begin dropping? 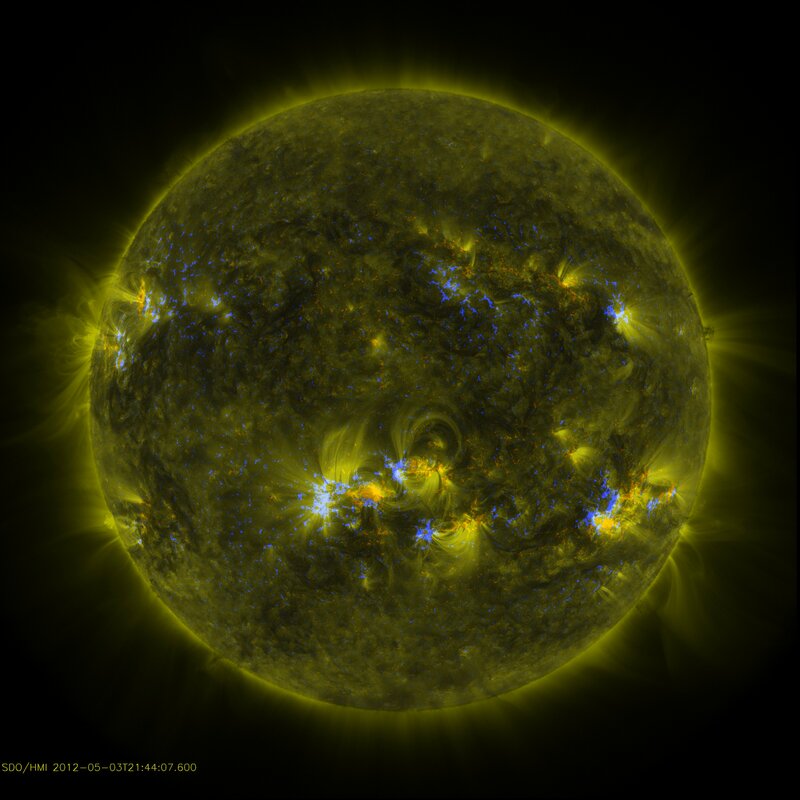 what does explain the match in sunspot number but mismatch in maximun date? There are cycles of warming, followed by cooling and in some cases abrupt cooling in the paleoclimatic record that correlate with cosmogenic isotope changes. All of the observational data points to the sun as the fundamental driver of the cyclic climate changes, including the very large, very rapid, Younger Dryas (Heinrich events) climate change events, that are capable of terminating interglacial periods. The unanswered question is how the solar magnetic cycle changes cause what is observed. It will be interesting to watch this cycle end. This does appear to be an interruption to the solar magnetic cycle, as opposed to a slow down in the cycle. The extreme AGW supporters should have left themselves a way out. We were not predicting the date [our method does not support a date prediction] so were only using the ‘nomimal’ date eleven years after the previous maximum in 2000. You are being far too modest. History will record that the seminal article on the length and strength of Solar Cycle 24 was published in Geophysical Research Letters on 11 January 2005 by Leif Svalgaard et al entitled SUNSPOT CYCLE 24: SMALLEST CYCLE IN 100 YEARS? 2005 was the hundredth anniversary of Einstein’s miracle year. With what we are currently witnessing in 2012 with the trenchant behaviour of the Southern Polar Field on the Wilcox Solar Observatories website 7 years after the publication of your article, coupled with the brevity of the article itself, has convinced me that the Svalgaard et al article would no doubt have drawn the Great Man’s stamp approval as a fitting commemoration of his achievements. 1687, 1859 and 1905 mark the years of some of humanity’s greatest ever achievements. Sadly, as the 2009 Climategate leaks (my absolute gratitude to the anonymous whistleblower forever) reveal we have now seen the depths of debasement that so-called scientists are prepared to stoop to. My absolute gratitude goes out to Anthony and heroes like Leif, Bob Tisdale, Ryan Maue, Joe Bastardi, Robert Brown of recent vintage who share their insights and help to bring us to a proper understanding of our place in the universe. Leif, the final death blow for the debasers and their claims of “settled science” should have come on 6 December 2011 at the Fall Meeting of the AGU, (who in fact published your article) with the Stevens Lecture on Clouds but the Anthropogenic Global Gravy Train with all its hangers on, has somehow managed to carry on. Richard Black and his BBC monstrosities somehow never got round to covering Stevens’s lecture and its inescapable conclusion that current climate models are incapable of properly modelling for clouds! Leif, it is one thing to arrive at a prediction that ultimately turns out to provide a the correct answer in PhD length dissertations that you need a PhD in solar physics to understand, but you arrived at the correct outcome that has been validated 7 years later in 4 pages of clear and easily understandable writing. . It was Einstein who produced a theory of such complexity that he said that only 11 men alive understood it, who endorsed the policy of making things as simple as possible. FWIW I believe we are witnessing at least an analogue solar cycle similar to the one a century and a half ago that spawned the Carrington event with wild and unpredictable peaks and troughs in solar activity. As I have reached exactly the opposite conclusion to the one espoused by you in the Forum section regarding the direct influence of the Sun’s Solar Cycles on the climate of the Earth on the Solarham.com website, (which tragically has gone missing in action in the past 2 days), I believe that a disastrous period of solar-induced global cooling and climate instability awaits mankind. Now that is Climate change I can believe in! Science is all about producing models and hypotheses that have predictive power. Your model has been validated in an area of physics that is vitally important to mankind and the names of Svalgaard and Cliver and Kamide as potential candidates should be drawn to the attention of the judges who awarded the 1921 version of the prize to Albert Einstein. Dalton Minimum looks more like it than the Maunder at this time. Dalton dropped Europe by a degree or so, though where you are talking about determines the number you use. Since we have risen in the 20th, and assuming that prior to 1975 was the recovery from the LIA, a Dalton Minimum at this time would only drop us back to either 1935 or 1960, thereabouts. Which wasn’t cold. We would have to assume that 1900 – 1950 was not a “recovery” but an excess amount after the 19th century for a Dalton type to push us into a serious cold with a drop of 3 degrees again. Even if we were to go into the Maunder, it took a long time to get seriously going. At this point we can’t say one way or the other. If the SSN had collapsed this year, the odds would have been better about a Maunder, but they didn’t. It will be interesting to see if meteor showers become heaver or have a greater hourly maximum due to lower cycles, about 15 years ago I read a study on the diminishing frequency of some of the regular meteor showers, I always suspected Higher solar activity could play a part in this, so maybe we’ll begin to have spectacular showers like those reported in the past?. The Aquarids meteor shower is coming up on the 5th of may I suppose it wouldn’t hurt to have a look. Leif Svalgaard and colleagues suggested that solar cycle 24 would be the smallest in 100 years in a 2005 paper in Geophysical Research Letters (see link in his post above). In view of NASA’s latest prediction, Leif’s paper will probably receive (and deserve) a good many citations. Leif’s presence adds much to the value of this site and is one of the reasons I often check in. At what point does predicting become watching? For some reason they don’t let you place bets on a horse race at the 1/2 mile mark. In view of NASA’s latest prediction, Leif’s paper will probably receive (and deserve) a good many citations. Thanks for your kind words, but our work does not rise to the level of Einstein’s [and was not meant to]. We still have a bit to go in this cycle before we can be sure that the prediction was correct, but it is pleasing that an idea put forward in 1978 seems to hold up. If it does, we have a good tool for future predictions. But, as I have said many times “the sun is a messy place” and could still have some surprises in store for us [which would be exciting, e.g. Livingston and Penn’s observations]. 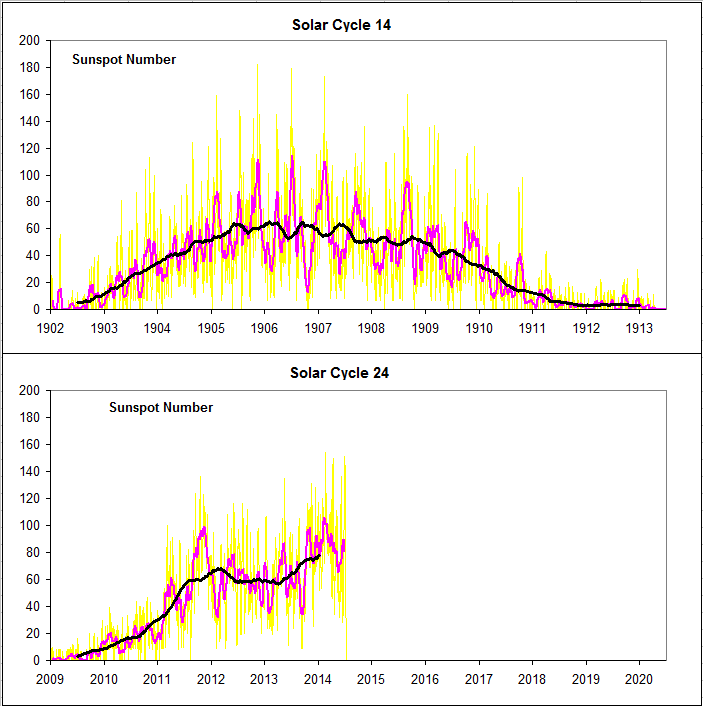 Since this is the first real solar cycle where all the raw data is now available to anybody who cares to look at it, I have no idea if the curious observed behavior of the Sun this cycle also flummoxes the long-time observers and modellers. The polar field data does look qualitatively different this cycle than last. The magnetic polarity zones on the sun do seem to have large-scale diagonal stripes, and the behaviors of the two hemispheres do seem different. Do the practitioners get up every day, mutter to themselves “What the heck…” as they look at the latest data, and rush off to stare at their models to figure out what is missing or mis-modelled? Or to the experts, is all this just boring more of the same, we’ve seen it all before? As a ham radio operator – this is a no brainier – this cycle has been a roller coaster ride! The spots are up – then way down – been that way for the past 2 years. Then there are the constant solar flares. The planetary A & K indexes have been equally strange. I’ve been on the air while these flares have occurred – talk about some weird sounds – one minute propagation outside of the states is excellent, 10 minutes later – nothing but weird sounds and a ‘dead’ band. Mother nature is a b!tch. Or to the experts, is all this just boring more of the same, we’ve seen it all before? Maunder or Dalton or a Solar Cycle 14 strength sun, a small solar cycle is alarming. The current state of the Sun and the refusal of the Southern polar field to budge is not a good sign at all. The state of the Danube last year points to a slowing down of the hydrological cycle in an area of historically very reliable rainfall. Cold means less evaporation and less rain unless you have access to a sea that is anomalously warm somewhere near you. Your assessment of where it is on the planet determines how you feel the effects of a weakening sun is exactly correct. There are vast differences between the Northern & Southern Hemispheres. The Oceanic Heat Content, or exactly how much heat is stored in the oceans and the rate at it is lost at, (Tropical Cyclones/Hurricanes/ Typhoons such as Yasi here in Australia and El Nino’s liberate an enormous amount of heat and transfer it elsewhere), and the ocean circulation patterns when the sun begins its weakening phase is very relevant. The cost of a Canadian heating bill in an El Nino as opposed to a La Nina winter! The current pattern of the Gulfstream, (poor pun intended), seems to be succumbing to a renewed Labrador current already. There many other factors such as the position of Earth’s geomagnetic poles at the time, the level of volcanism, the stage of the Milankovich cycle. However, the fact is that the Northern Latitudes have exhibited extreme non-anthropogenic climate change (ie Natural) in the recent past that worries me. Tree rings in Texas demonstrate mega droughts more extreme than 2011 disaster by orders of magnitude, the Vikings grew barley in Greenland not that long ago and examining the stomach contents of frozen mammoths, shows just how quickly they succumbed to a sudden change in climate. The Mammoths did not decompose which would have happened in the ordinary course of things if a warm period had intervened. The ability to predict the size and strength of a Solar Cycle is vital and that is why Leif deserves the accolades due to him. Here is a compilation of predictions for SC24. As you can see, there are 45 of them, more than enough to fill a roulette wheel, and they are “all over the map”, so somebody had to be close. P.S. I have NO opinion on this subject since I have not studied it. Skill Testing Question – How many people were predicting imminent global cooling a decade ago? solarham.com now has his own private server. his host was not supporting the amount of hits he was getting, had to get his own. Its up and running now, http://www.solarham.com/solarham.com works. I believe that you could possibly grow barley in Southwest Greenland (where the Vikings settled) today although no one seems to do so. Apparently some varieties of barley only require three frost free months. They do grow rye and (recently) potatoes. There are small herds of sheep and a few cattle — which presumably means that Greenlanders can grow enough silage crops in the warmer months to last over the Winter. What is impressive is that the Vikings in Greenland lasted for about 500 years — which implies that they had enough “climate margin” to survive occasional bad years and probably a few sets of several bad years back to back. Which heat will decline first? The measured heat or the “hidden heat?” It’s a travetsy that we don’t know! Anyone who has plotted SSN numbers from the late 18th century to the present (I did it for fun about 4 years ago) would see an obvious ‘beat’ to the cycles which would lead you to predict weaker cycles right now. Thing is, that 200+ year time span only really covers one or two ‘beats’, so to say it’s real is pure hypothesis. The reality is almost certainly that it is a ‘beat’ within a ‘rhythm’ within a ‘tempo’. Thing is, we’ll all need to breed for at least 100 generations before we can say that based on direct scientific observational data……..
Because there may be stochastic events in the Sun which may disrupt that beat for all we know…. The observations of the radio ham operator posted at Frozenohio @ 9.52 regarding the solar roller coaster are also surely relevant. Leif, In your 2004 paper you pointed out that 2011 should see solar maximum and I thought that you were merely teased us with your comment of “Welcome to Solar Max” on the TSI diagrams on your website. 2011 has come and gone and while we saw the Northern Polar field reverse, we are now seeing the Southern Polar field, if anything, seemingly moving further away from reversing. The breakdown hypothesis of William Astley, as opposed to mere slowdown, now seems very plausible to me with a worse collapse in solar output than the 2 small cycles in the early 20th Century. Jan Alvestad at solen.info, using data supplied by Todd Hoeksma of Sanford University has weighed into the solar maximum/polar field strength debate and very helpfully given his thoughts on the issue. I am certain that you know Hoeksma’s data like the back of your hand and in light of your 2004 article there is nobody better than you and your colleagues to interpret ongoing Solar Polar Field Strength data. Alvestad’s opinion can be accessed on Anthony’s Solar reference page (http://www.solen.info/solar/polarfields/polar.html). Jan Alvestad’s prediction made on 27 June 2011 of a reversal of both fields between February 2012 and December 2012 appears to be very unlikely. It appears to me that for the foreseeable future we will have a Sun with 2 south poles and common sense tells me that this must have some noticeable effect on Earth’s climate. Has solar maximum in fact been reached in 2011 as your TSI diagram reflects and not in 2012 as predicted by Alvestad or is there going to be explosion in sunspot activity in the Sun’s southern hemisphere? All the literature speaks of how easy it is to predict the size of a sunspot cycle once it has commenced. Something very usual is afoot. As Alvestad last provided an update on 27 June 2011, would you or one of your colleagues please point us in the direction of what might be happening. Is SC 24 peaking already??? … or is it tricking us? But I put this in wikipedia for SC24 a month ago with full credit to Dr. Svalgaard. NASA failed to mention his paper. This success has only one father, my thanks to the younger daughter. Could four poles explain the Maunder Minimum’s ‘large, sparse, and primarily Southern Hemispheric sunspots’? You almost have to feel sorry for the poor Warmunistas. Everything was going so well for them until: SC23 turned out to be so weak and now SC24 looks to be the lowest in 100 years. To make matters worse, CERN was finally allowed to conduct the CLOUD experiment and it turns out GCRs do, in fact, nucleate inorganic compounds, which create increased cloud cover and cooler global temperatures. I can’t wait for Svensmark peer-pending paper to come out, showing the evidence that +50 nanometer cloud seeds are possible in the Scensmark Effect. Does anyone have any news approximately when Svensmark paper will be out? TIA. Low cycles have a long drawn-out maximum that can last several years. For me, that maximum began in 2011 and will last several more years. This situation is quite common, for example also in cycle 19, see http://www.leif.org/EOS/Babcock1959.pdf and I don’t expect any effect on the climate, but then apparently ‘common sense is not so common’. Anthony, thank you for the Facebook link to your articles. It makes it easy to share with my sphere of friends the great articles your site posts. The AGW crowd is getting uneasy, recently Jim Rossi of UNLV a graduate in sustainability posted upon my Facebook page. There are some very rude manners out there. Dinner on me when you are in Sacramento. We were also aware of Hathaway’s now-failed prediction of SC24 peaking at Tmax ~160, and the prediction by NASA? that SC25 would be very weak. Recent information include the much-lower prediction of a Rmax of ~60 for SC24, and recent work, which I have scanned but not studied, on solar impacts on Earth’s climate. Will global cooling become serious and significant? I do not know, but I think this is a very real possibility – there is a significant probability of serious global cooling commencing by 2020-2030, or sooner. Serious global cooling could significantly decrease the global grain harvest, which would have major impacts on humanity and the environment. If this occurs, based on current political realities, humanity will be woefully unprepared. It would, in my opinion, be sensible to start now making cost-effective preparations for this possibility. These measures would include ensuring that stockpiles of grain are adequate, and accelerating the further development of frost-resistant crops. Is this an alarmist position? Another misguided application of the “Precautionary Principle”? I suggest not – first, the net costs of my modest proposal are not that great, especially when one considers the huge amount of American corn that is currently being squandered in corn ethanol production. My proposal costs much less than the very costly, inefficient and self-serving “green energy” schemes of the global warming movement, Furthermore, I have no financial interest in promoting climate alarmism, and a sincere interest in reducing the needless suffering of humanity and the resulting destruction of the environment. I still find the predictions of De Jager most accurate and in contrast to Svalgaard he does see an important role for solar fluctuations in the earth’s climate. The recent warming period until 1999 is in his view not unusual given the variations in solar forcing through the last centuries. De Jager adapted this expectation in 2010 based on new observations and better interpretations to an Rmax of 55. Also the Grand Minimum is expected to be deeper and Maunder like. There is (to science as yet unknown) close correlation between the solar activity and the geomagnetic field intensity change in the Antarctica, at location of the geographic South Pole. This should be of interest to all those who are interested in solar, geomagnetic and climate sciences. No it’s caused by electromagnetic waves that permeate space and hit the surface of the earth. They then shake up the surface which causes it to warm and in turn heat the air. The heated air then rises and the electromagnetic waves escape back into space. Unfortunately some bump into carbon dioxide on the way up and are absorbed then split into many bits and scattered in all directions. For some reason they don’t seem to hit the carbon dioxide on the way down. Luckily the chance of them actually hitting a carbon dioxde molecule is minute so most make it out to space where they shoot off in all directions obviously frightened by their experience on our planet. What’s goind on with the so called solar conveyor belt. If I remember the discussions correctly, that was supposed to be a predictor of not the next cycle, but the one after, in this case cycle 25. A few years ago, that thing pretty much ground to a halt. Has anyone considered that high energy CRF may be a cause, not the effect of changes in solar activity. Perhaps high energy CRF is modulated by celestial bodies outside the solar system. The rays may act as a catalyst or buffer for certian types of recations. Of course, large force with appropriate periodicities are probably too far away. Spurious correlations don’t need causes or explanations. 40 years ago, as a young scientist, you would have been excited by prospect of investigating something new, now as an experienced scientist of international repute, you just can’t be bothered, far easier and more expedient to dismiss every unknown as ‘spurious’, not to mention that it may discredit the idea of ‘leveling’ of the historic sunspot number values. Despite many valuable observations and comments, which I always pay lot of attention to, your attitude is getting ‘spuriouser and spuriouser’. No harm done in exchanging opinions regardless of if being just an odd ‘coincidence’ or some physical process previously unknown. Here in the US, we are still paying farmers not to farm, and using about 1/3rd of our corn crop to make car fuel. There’s a lot of farmland in places like New England that were abandoned when they couldn’t compete with the newly opened mid-west. Those areas could be converted back to farms. Millions of suburban homeowners could re-start the WWII era victory gardens. It may not be pleasant, but we could also start eating lower on the food chain. Less meat and more grains. That would allow a lot more people to be fed as well. There’s plenty of spare capacity should global temperatures turn down. Yes, there is harm, as it detracts from studying the real thing. For every ‘physical process previously unknown’ there are thousands of spurious correlations and coincidences that lead nowhere. Ok, let’s say that correlation is spurious, but the data from which delta Bz is calculated is accepted as good by most reputable science establishments. Inevitable conclusion is that the 10Be Antarctica’s data are also of spurious value. Well maybe, I looked at rbateman’s butterfly plot above. And while the density of spots at the very far right seems slightly higher, there doesn’t yet seem to be any movement toward the equator. I compared rbatemans butterfly with the NASA one, and it seems that while cyle 14 is the closest match to rbateman, it’s clear that Cyc24 SH has less equatorward drift than 14 did. So Nature rhymes, but doesn’t repeat. It has already begun to retreat once more back towards the South Solar Pole, where the Coronal Hole awaits it. This general retreat is #3 for the Southern Solar Sunspot Belt. There may be other retreats before 2011, but the data is too haphazard due to lack of spots. When you put your infamous “Welcome to Solar Max” version #1 on your daily graph, Leif, you marked the current max point of advances of the Southern Solar Sunspot Belt. This last run did not get as far towards the Solar Equator. So, my friend, don’t 2nd guess yourself. You nailed it. Robert in Perth- It was a genuine pleasure to read your post today. 1. IF Earth returns to the colder global temperatures of the Maunder Minimum circa 1700, what will be the impact on the global grain harvest? How long would it take for agriculture to adapt and what grain stores would be required to mitigate shortfalls prior to such adaptation? What other impacts would matter – e.g. energy supply? Are we currently capable of managing the impacts of this natural global cooling, or not? 2. Same question for the Dalton Minimum circa 1800. Does anyone know if this question has been posed and adequately answered amidst all the billions of dollars that have been spent on global warming (aka “climate change”) research? Because, based on the evidence to date, the catastrophic humanmade global warming crisis does not exist, and natural global cooling, whether moderate or severe, is increasingly probable. Does anybody have the animated gif file of the changing Nasa predictions? It used to be on SolarCycle24.com I believe and it was a compilation of the monthly predictions from Nasa that inevitably went down and spread out but I’ve been unable to locate it’s source. It would be interesting to see the predictions animated from 2003 until now. I guess we can call the “smallest cycle in 100 years” the “consensus scientific view” now. operation procedures in the years ahead. Actually over the whole period something like 10,000 nT, and the correlation you show is not that great, just compare the dBz around 1780 and 1980 where solar activity were about equal, e.g. The 10Be record has been corrected for changes in the geomagnetic field, so no such conclusion can be made. It certainly will be when the cycle is over. Oh he fixed it, Been following him on Facebook. he had the /solarham.com until it was fixed. Peak of this solarsycle is behind and it is 60. South peaks next january but it’s about 55 smoothed. “Is it time we stopped trying to predict a non-linear, chaotic system. Leif, I keep seeing statements to the effect that the northern pole has already switched. How is this determined? I have added the Dome Fuji data (I have a data file only to 1900), the correction you mention doesn’t appear to be very effective. I would look at my plot http://www.leif.org/research/WSO-Polar-Fields-since-2003.png and say the North polar field [blue] is reversing right now [dashed blue curve]. If you look at the high resolution data http://sdowww.lmsal.com/sdomedia/SunInTime/2012/05/03/f_HMImag_171.jpg [you may have to click on the image depending on your browser] you can see lots of orange dots [positive polarity] at both poles. “The sign of the north polar field, however, remained positive until November, 1958, when it rather abruptly became negative”. the correction you mention doesn’t appear to be very effective. So the field at the pole can have switched, while the average field inside the black square may still be influenced by remaining old fields in the equatorward portion of the square. Thanks for the explanations, Leif. Much appreciated. My understanding, NASA does NOT make predictions about Solar activity and Dr. Hathaway’s predictions, though on his NASA website with NASA logos in the page banner, are purely his own effort and not reflective of any official NASA position. Why is Hathaway steering the public, using his home grown effort, away from official statements made by NOAA? This doesn’t appear to support intra-agency coordination. NASA is not making predictions and Hathaway’s is his alone. That the NASA logo appears does not mean that this is an official NASA website or prediction. There is nothing wrong with Hathaway using the logo. What is wrong is that people misrepresents this. Sometimes simply to throw mud on ‘officialdom’. I recall from James Delingpole’s book “Killing the Earth to Save It” that the global grain surplus (presumably the qty in storage not required to meet immediate consumption needs) is around 15%. In other words, pretty slim. Or to put it another way, no real buffer at all. I think you had it spot on Allan. If it cools significantly a lot of people are going to be in trouble. Sadly, those presently living hand to mouth will likely fall off the perch in large numbers. Andall completely preventable. All the trillions of dollars stolen and wasted on AGW mitigation related scams but nothing (?) for the far more realistic prospect of a rapid global cooling. I fear that if it does come to pass, in time this inaction and obfuscation will come to be seen by many as a crime against humanity. And for the ‘Club of Rome’ types it clearly was a pre-meditated one. Isn’t this article on the NASA website just another manipulation by the AGW conspiracy who use fake sunspot data to make the climate truth movement look bad, when global cooling doesn’t happen and global warming continues despite allegedly decreasing solar activity? I do not see why a somewhat decreased solar activity would have a strong effect on the ocean heat content or lead to a drop of the globally averaged surface temperatures, in comparison to the effect by other climate drivers that increase the heat content and the surface temperatures. At least from a point of view of the energy balance. The radiative forcing between maximum and minimum of the solar cycle has been about 0.3 W/m^2, i.e. between the average over the whole cycle and the minimum, let’s say 0.2 W/m^2 to be conservative. On the other hand, the increase of the radiative forcing by CO2 is about 0.25 W/m^2 per decade at the current rate of change. So, even if the solar activity had staid at the most recent solar activity minimum forever, such decreased solar activity could counteract the radiative forcing increase by CO2 of only 5 to 10 years. So, I do not see that the global cooling so many here are expecting will happen, if the current rate of increase of greenhouse gases in the atmosphere continues, even if the sun goes to a Maunder minimum like state during the next decades. It will delay global warming only a little bit compared to how it would be if the solar cycles continued as in recent decades, everything else equal. It’s funny how the moderation of an opinion blog that again and again ridicules, smears, or otherwise personally attacks scientists who publish papers with results of research not liked by the maintainers of the website and by many of the commenters can’t even take some little sarcasm that mocks the mindset of many here. You are very sensitive for someone who doesn’t care much about the sensitivity of the ones attacked by this site and its devote followers. Also, your bias shows, since you felt challenged to comment in this case, compared to all the really nasty verbal things produced by other people here you apparently don’t mind, as long as it goes against those evil climate scientists. This is not the first time you’ve tried to smuggle a stupid, outrageous comment on to this board on the theory that the stupid, ignorant deniers will swallow anything that is anti-science. “Tried to smuggle”? Why do you say “tried to smuggle”? And not just “wrote”? This isn’t the hypothesis. My comment is actually based on following hypothesis: The mindset of most of the “skeptic” crowd is setup on the premise that most of the evidence in support of anthropogenic global warming presented by a whole body of research done by thousands of scientists from all over the world for the last decades is fabricated, by manipulating or inventing the underlying data, or by presenting faked results in the peer reviewed scientific literature, and on the belief that there was some kind of global conspiracy that had produced such a “global warming swindle”. A conspiracy that has usurped all the relevant international scientific institutions, academies, and government agencies, pursuing some sinister agenda and driven by non-scientific motives (like getting riches and power by working in academia, achieving nerd world control, or whatever), devilish oppressing the truth, which has its bastion in the Internet blogosphere with blogs like this one here, and in organizations like the Heartland Institute. … and the systematic deconstruction of appallingly shoddy, politically motivated pseudo-science. If you believe this is what you are doing here. I see mostly disinformation about climate science and the research that is done in the field. Well, I look forward to your systematic deconstruction of the politically motivated pseudo-science produced by the Heartland Institute and by the crowd at their next “climate conference”. Also, will there be an article by Anthony Watts on this blog strongly condemning the recent outrageous, politically motivated PR smear campaign by the Heartland Institute that has put up billboards where it equalizes, by applying guilt by association, people, including many climate scientists, who maintain that anthropogenic global warming is real and threatening, with mass and serial murderers? We will see. Firstly, your reference to Hansen in reply to what I said about the Heartland Institute campaign is a tu quoque argument. Secondly, Hansen expressed his personal opinion about the consequences of coal burning for human life, although I wouldn’t have used this choice of words. His statement refers to the causal relationship between coal burning and the death of people how he sees it. How is this equal to smearing people by purely applying guilt by association, which is what the Heartland Institute does in their campaign and in their justification for this smear campaign? [*] (BTW: Just for clarification. Hansen is technically not by boss). As for your book recommendations. I prefer scientific publications that genuinely inform me about results from research in climate science, but if you think I could learn something from those books, what about I give you my address, and you send the books to me through Amazon (or whatever bookstore you prefer)? What about my hypothesis about the mindset of most “skeptics”? Do you think I’m way off how I describe the views of this crowd (your view?)? You have fallen silent about this. I’d answer that the mindset of the majority of people that support the hypothesis of AGW misunderstand “the greenhouse effect” of CO2 and that misunderstanding has no bearing on the actual science or scientists that study atmospheric CO2. I’d also observe that radiative power difference may not be the prime driver in ocean temperature. It seems rather obtuse to be able to understand that CO2 isn’t even a source of energy but can affect ocean temperature while not contemplating that slight differences in the type of solar radiation might affect things like cloud cover. It’s the observation and correlation of sunspot activity to historical temperature changes that’s of interest. Just as AGW is the observation of the correlation of CO2 concentration with temperature changes. Turning correlation into causation is where the science comes in. Every scientist should be skeptical of every theory that turns correlation into causation but it doesn’t mean they shouldn’t explore those theories and propose them. Lastly, terms like “Climate Change Denier” that is reminiscent of “Holocaust Denier” is particularly offensive to me. Associating a difference of opinion about how, what, where and when natural resources should be used with someone that consciously decides to murder people is abhorrent. I certainly understand that AGW proponents believe their solutions will save lives even if I disagree and believe personally that those same solutions will cost lives. Please return the courtesy. Don’t see future cooling, so how about increased global cloud levels for one? On uncertainty, see: Nigel Fox of NPL Uncertain, impaired, models, especially his observations and presentation that cloud uncertainties are 93% of total. With sign and magnitude of water vapor feedback dominated by clouds, there is not much quantitative left to support CO2 arguments pro/con. The TSI record relies upon the data from many different solar radiometers flown over the last 20 years, whose inherent variability (~0.8%) could affect the prediction of models of global temperature change by as much as 0.8 K.
But they didn’t as the variability was eliminated in the final composite time series that were used in the models. TSI and clouds variability are far too low to account for major climatic changes such as MWP, LIA and latest GW . Ocean currents are main distributors of heat from the equatorial to the high latitude regions. Any change in intensity of these currents will be directly reflected in the change of the atmospheric temperature and the associated parameters. Circumpolar current is a primary pump of the world oceans conveyor belt. Its intensity may be partially function of the ‘South’ magnetic pole’s strength, which in 1700 was 68.5 microTesla while today it is 52.5 microTesla, change of ~ 23%. Jan P. Perlwitz – that was a lot of material from you to work through. You start off by saying “I do not see why a somewhat decreased solar activity would have a strong effect on the ocean heat content …..“. I have no trouble believing you (ie, that you cannot see it). But not being able to see is no good reason to dismiss out of hand, when there is plenty of evidence to support it. Clearly the MWP was of comparable temperature to today’s, and the RWP before it. Clearly the LIA was colder. Something had to have caused those temperature changes, and that something appears to have been the sun. Certainly they could not have been caused by man-made CO2. You do not see it. Maybe, instead of insulting those who question, you should be looking for it. One very serious possibility, being investigated by Henrik Svensmark and others, is that the sun affects our climate by mechanisms other than simply the direct forcing. He has progressed his theories, backed by laboratory testing by himself and by others, to the point that they are now much more credible than – for example – the cloud feedbacks relied on very heavily by the IPCC. Note that cloud feedbacks are acknowledged by the IPCC to be an artefact of the climate models and that there is no evidence that they occur. A final irony is that they are a supposed indirect effect accepted without any evidence, while the possibility of their being an indirect solar effect is dismissed without discussion. In a later comment you say “The mindset of most of the “skeptic” crowd is …..“, and proceed with an insanely stupid set of absurd insults dressed up as a massive argument from authority. I cannot speak for ‘most of’ the sceptics, but my perception is that the mainstream science has too many flaws in it to be accepted as settled – and on top of that, that the mainstream scientists are pushing too hard to close down debate, to insult (as you did) those who question, and to prevent alternatives from being heard, in short, they are behaving too unscientifically to be believed. One day, we will all see it. For now, as you so correctly say, you can’t. Thanks, only goes up to around 2005, the link below updates to near 2010. Over the recent period where global temperatures haven’t warmed, low levels clouds after declining have stabilized and are especially apparent with more recent data below. Overall after a lengthy period of mid and low level clouds combined declining, there are now after stabilizing recently increasing. the ‘South’ magnetic pole’s strength, which in 1700 was 68.5 microTesla while today it is 52.5 microTesla, change of ~ 23%. There is no physical reason or cause for any such link. Pure coincidence. Correlation with the W. L & S. (2005) TSI appear to be even stronger than one with the SSN. –	circumpolar temperature wave (8-9 year period) is responding to the (integrated ) TSI and is generating counter EMF, order of few 100s of nanoTesla. –	Geomagnetic storms have a far stronger input into the Antarctica then previously thought, with the responding ascend /decay time constant of about a decade. Either way, it appears to be one of the four pillars of the oceanic climate dynamics, together with the North Atlantic, North and the Central Pacific,. Again: spurious correlations do not require explanations. Still just hand waving, no quantitative analysis, no numbers, no specific mechanism(s). Mike, we live on a highly intrinsically variable, dynamic, living planet equipped with its own drivers that come and go in strength and magnitude. Intrinsic variability is by far, the greater source of change needed to create larger climate changes and relatively smaller weather pattern variations within stable climate boundaries. I thought it referred to a repeat of my sentence just above ‘ditto’, and since I value your opinions I quoted it. But since it did not, it was misunderstanding and I have deleted it; my apology. I just added a correlation graph, factor of R^2 =0.7718 suggests that it is unlikely to be just a coincidence. You do this the wrong way around. Your argument would be correct if you had a valid physical theory [which you don’t] that predicted the curve, then found a high R^2 with the data. If you look around and around and around at many things until you find something that matched [i.e. has a high R^2], the R^2 is meaningless. I thought it referred to a repeat of my sentence just above ‘ditto’, and since I value your opinions I quoted it. If you value my opinion you shouldn’t delete it. Apparently the value of my opinion is determined by how much it supports yours. I don’t remember we ever had an agreement, but that doesn’t mean that our exchanges were wasted, to the contrary. There is detectable disconcert in your post (re R^2), which also indicates that there is more to it than coincidence, ask Professor Norm Sleep on my behalf and for a benefit of many. Just didn’t bother to check Antarctica, agree it is sign of a sloppy science. Thus the Antarctic’s correlation is even stronger than one in the Arctic. Coincidence for both magnetic poles? That is not a valid theory at all. It doesn’t matter how many times you suggest the same thing, it is still fundamentally wrong. The dipole is common for both poles, so no wonder there the same wiggles. Not at all, my remarks are standard statistics. These graphs use data from the ISCCP but Evan et al determined that the ISSCP D2 data is prone to errors at the extremities of the vision of the various satellities (see Evan A. T., A. K. Heidinger, D. J. Vimont (2007), “Arguments against a physical long-term trend in global ISCCP cloud amounts”, Geophys. Res. Lett., 34, L04701, doi:10.1029/2006GL028083.). This paper includes a regression map (see below) but as Dr William Rossow of the ISCCP team has said, the paper lacks numerical details in its description of the analysis technique. It may be only another 5 years, but the fact this makes a period of increasing overall cloud levels for more than 10 years may be significant in future. Considering this has occurred at the same time global warming has failed to deliver. Nothing else has changed during this period that can explain the non warming period. Therefore future changes in cloud albedo need to be examined to confirm this theory. I agree in part Vuks. Increased solar activity (last century) increases the likelihood of more geomagnetic storms hitting Earth. And dare I suggest Earthly warming.. Changes in the radiation belts too..
Not quite seeing the drag-on for LOD but I’ll work on it. Thanks for the comments rbateman, you too Dr. Svalgaard. So what? once the cherry-picked wiggles even roughly matches, the spectral response will too. NASA-funded researchers say the solar storms of March 8th through 10th dumped enough energy in Earth’s upper atmosphere to power every residence in New York City for two years. So what? You and many others have poor sense of proportions. New York City uses 10 GW, or the amount of sunlight falling on an area of 5 square kilometer [a 1/100,000,000 of the global input]. Trifling. So what? You and many others have poor sense of proportions. New York City uses 10 GW, or the amount of sunlight falling on an area of 5 square kilometer [a 1/100,000,000 of the global input]. The number is [deliberately] not quite correct [although of correct order of magnitude]. As a useful exercise, try to calculate the number yourself. And report back what you think it should be. An impartial observer would say your argument doesn’t sound entirely convincing. Data are accepted as the best available, geographic poles are the best defined locations on the planet. Solar cycle is 11 years, circumpolar temperature wave period 8-9 years, calculating difference in the Bz change across any period between 10 to 30 years produces similar results. Not much there to be cherry picked. I suspect if Wolf had his magnetic needle in the Antarctic he would have recorded then what I found now in the geomagnetic data. –	there is an electro and magnetic feedback loop ( sun-J/S magnetospheres) which the Earth regularly transverses. Obviously I’ll opt for the second (vukcevic strikes again). I am not entirely convinced that ‘So what?’ alternative as a ‘peer reviewing’ comment would be acceptable to a science paper publisher, you can do better than that. A convincing counter-argument is required. We have been over this so many times that it has become tedious. Many peer reviews consist of dismissing crackpot ideas right up front. Review works as a filter to weed out such ideas, leaving the better ones for more serious consideration. Call this ‘gate keeping’ if you like, but such is necessary in any field. Such is required only if your argument is convincing, which it is not. I agree, crackpot ideas should be dismissed, but data which are accepted by the world science institutions can not. This is not correlation between price of the US postage and your car’s flat tyre. This is a correlation between the solar magnetic output as represented by the TSI and change in the magnetic field in Antarctic. There is no easy way out of it, you got the knowledge and experience, you have to face the challenge, even if goes against the grain. Science expects it from the top people. As I said, spurious correlations do not need an explanation. Especially not when one of the data sets you use is flawed. Of course, you were entitled to claim that the Wang Lean Sheeley data set is flawed since there was no an independent proxy which could test its accuracy. Now we do have a good proxy in the Antarctic’s magnetic field bi-decadal variability, which not only proves that the WLS data are good but correlation is far from being spurious. I shall leave it to your to decide if to ignore or take-up the challenge. That is what the workshop I”m at right now will be solving. It does not look to good for WLS. I whish you all luck, if you fail I would be only confirming existing, no fun in that, but if you succeed I shall look forward to opportunity to challenge you. Sincerely hope that you get your ‘SSN ironing’ done. Will look forward to your report. I cannot believe how people wind up clinging to nonsensical statements such as “Falling or stable global temperatures are caused by the Sun and rising temperatures are down to carbon dioxide alone.” Now I don’t know if the person who said this above was saying it ironically/sarcastically, speaking for the alarmists, or if they really meant it. That doesn’t matter. What matters is such a statement still ignores the established fact that, in the past, temperature started to climb THEN we saw a rise in CO2 that followed. How one can conclude the former was produced by the latter is beyond me, but people actually do believe it passionately. Mike Jonas – I find a much better answer to those who still advance “science is settled/consensus” arguments is that they’re arguing politics, not science. Facts, truth, logic and science don’t care how many people get it right. They don’t care if NO ONE gets it right. They remain facts, truth, logic and science in any case. Consensus is a political argument, not a scientific one – that is what all those who worship consensus never figured out, apparently. Are you for real, or just being sarcastic? Please provide a source. A reliable source. I heard there was a thing called yeti, sasquatch or bigfoot, but I wasn’t foolish enough to believe it. I also heard, from reliable sources, that this solar cycle was going to be one of the smallest ever. See above for RELIABLE SOURCE. yeahRITE. That’s why everyone who’s ever studied the issue seriously and honestly disagrees with that statement. Some people say it’s all to do with man made CO2. Has anyone else heard of this or was I hallucinating? As for your second part, about hallucinating, perhaps if you fill us in on what you had just smoked, injected or ingested we can answer that part more accurately. As for your first part yeah, I did hear some people make that claim. They’re the same people who openly state they feel it’s appropriate to lie to us to get us to do what they want us to do. They’re the same people who openly admit to deliberately altering data then gloating publicly about the success of their efforts. They’re the same people who will offer a chart that shows that, after temperature rises, CO2 follows yet still say the lagging indicator caused the leading one. I hope you were being sarcastic. Really. Bob Roberts – thanks for the comment. That argument may work for you, but to some people no argument works. They typically just say “that many scientists can’t be wrong”, or they invoke the ‘precautionary principle’. It seems there has been a sea change in Australia recently, because of the carbon tax. So in Australia at least the driver is as you say, political not scientific. which while not of the actual science could strike at the credibility of the scientists. Media Watch has previously levelled severe ctiticism at journalists simply for reporting views sceptical of CAGW, so it will be interesting to see where they go with this one. Coming back to Jan P. Perlwitz – JPP is a NASA scientist http://www.giss.nasa.gov/staff/jperlwitz.html, so my argument for him is necessarily a scientific one. I took on an ex president of the [UK] Royal Society with a similar argument recently, after they wrote a strongly pro CAGW article in a local RS publication, and to my surprise my comment was published straight away. I am waiting for this month’s issue to see what reaction I get (here, as in the UK RS, there are some vehement CAGWers).